Pets are allowed with a $25 fee per pet per stay. We do ask that the pets stay off of the furniture and must be house trained. 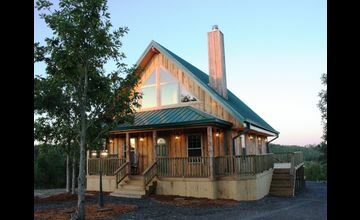 The cabin can comfortably sleep 3 couples, with our 3 bedrooms on 3 different floors. We have 1 King, and 2 Queens. There are 2 cots, 1 extra foam twin mattress, and a twin sleeper chair for extra sleeping. Most guests use these for their children or other guests. Our maximum is 12 people. Yes, we do provide bed linens and also towels for our guests use. Q. Is the kitchen fully stocked? Yes, it has pots and pans, dishes, glasses, coffee pot, coffee, paper products, dish washing soap, sponges, silverware and other utensils. There is a side-by-side refrigerator, electric dishwasher, electric stove and oven, microwave, toaster, and blender. Q. Do you have a grill? Yes, there is a gas grill on the side deck with a propane tank attached, and one extra in case the other one runs out. Q. Do you have a firepit? Yes, there is a moderate size firepit on the covered back deck with a wire cover for spark reduction. Firewood is provided and stacked on the back deck. Yes, there is a hot tub on the side deck. Q. Can we fish in the 12 acre lake? Yes, the lake is stocked with catfish, wide mouth bass, perch and blue-gill. Q. Are there any boats for the guest use? Yes, there are 3 kayaks, 1 canoe, and 1 aluminum flat bottom boat free of charge to the guests. There are live jackets of various sizes in a bin down by the boats.